Mini Fiats with batteries - Own your own Enzo! Welcome to the club page for remote control model FIATs. I started with a Mad Bull – a sort of standard entry level, easy to build, drives anywhere, but limited tuning. My latest project is an Enzo Ferrari from TAMIYA and I'd like to talk about that. I run my cars at our school r/c club. We aren’t allowed to use any fuel, so electric is the driving force! I chose a 1/10th scale Enzo Ferrari because its battery sits parallel to the rear drive shaft – with better balance and handling. Like all these models its also 4-wheel drive. Its body is plastic and strong (although pricey at over £45.) Aluminum and carbonfibre options are available too but cost more. The chassis was easy to assemble. 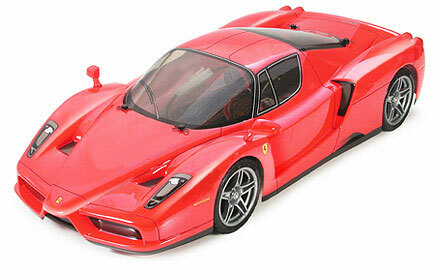 This wouldn’t be my first choice of Ferrari, but Tamiya make it in standard (TT-01) and race (TB-02) forms. TB-02 comes with race shocks and ball race bearings. It’s cheaper to buy this package than upgrade later, if you can afford it all at once. The Enzo body comes as clear plastic to spray inside, masking out the clear windows first. I couldn’t find the Tamiya colour I wanted – Ferrari Sunburst Yellow. So I used Fiat Broom Yellow with a white primer behind. Problem is it tends to flake off on heavy impact. We are going to try protecting it with a lacquer coat inside. I liked blue window tints and found a stop light spray by Folia Tec from Halfords. Works well – lots of thin coats needed. Tip 1 To cure the paint-flake problem I’ll use the recommended polypro paints that stick to the shell and resist impact shocks better. Even if they don't look so cool. Tip 2 Unless you want a stone dredger/ road sweeper, do not cut off the body mounting posts as Tamiya show on their build manual photos (see above). You need to be able to change the ride height of the body! Tip 3 If you keep loosing the pins to hold the body on the posts try paper clips they’re cheaper. Tip 4 Check out the HPI body shells at half Tamiya prices. The Enzo is highly nervous in cornering - but at the right times - so you can flick it easily. I set it up like this, but you could just as easily set it to a different driving style. My way it needs quicker opposite lock reactions but it also corners faster. Our club meets after school every other Thursday. We use a small car park at the back of the school. It’s mostly enclosed with trees walls and shrubs to catch the cars when they get flicked into the air. I won the last championship after a close fight with my main rival, who races a highly tuned Subaru Impreza. He finished 2nd last season behind my Mad Bull. This year his Subaru is much quicker. In third is a Toyota Supra which is the quickest down the straights - not as good cornering. All three are on Tamiya chassis. There are 9 more in the field but they’re not as quick. Newest arrival is a Lotus Exige with a shell from HPI. They cost about half of the Tamiya shells and are worth checking out. I’m thinking of joining the nearest R/C club at Aldershot too but it’s a long way to travel. I like the chassis rigidity.. its flickability…balance, weight distribution and steering accuracy. Also has good wheelbase size. I don’t like the easy way it collects stones from the tyres inside, the vent hole under the motor (I blocked mine up) that badly clogs up your motor leading to frequent cleaning. I also dislike the rapid wearing motor bushes, and its weak points: the plastic joints on the steering arms (pop off on impact), plastic diff casing, and especially the nylon drive gears (tend to get munched in competition). I replaced the drive gears with aluminium ones as soon as I could. The Enzo wing mirrors last about 2 seconds in competition. With the next tuning parts the Enzo will be seriously modded. I’ve bought a 9 twin turn motor, along with a matching electronic speed control (ESC) and race slick tyres. A new motor will often need another compatible ESC and they can be as expensive as the motor itself. If you can’t afford this lot, I’d start with different grades of spring and oil for the shock absorbers (try and choose shock absorbers that are oil filled) or a decent speed control (ESC) that will liven up even a standard motor. Springs should come in pairs with different strengths (spring rates). And they should be colour coded to help in testing/ swapping. Look at the drive gear ratios too. To keep the wheelspin down you need to know the surface and tyres you will use – how much grip there is. And check if your car reaches its top speed before the corners in races. Changing the final drive ratio will trade acceleration for top speed (or top speed for acceleration). Look at when you want to overtake other cars in your races too – I mean where your car is faster or slower than theirs. How fast are they? Electric have near instant acceleration, only limited by wheel spin. My Enzo does 40mph in about 1 second (again depends on the wheel spin) and tops out at about 60. Nitro have a clutch and gears and are probably slower off the mark, but tend to have better top speeds - like 80mph. Do I choose Nitro or Electric Power? First Nitro - Nitro fuelled motors give more power and top speed, and better endurance. But it’s more difficult to find places to run them. The fastest can reach 70-80 mph so are really only usable in wide-open spaces or on purpose built club tracks. They may need catch fencing if/ when they fly and the public/spectators need to be protected or zoned away from the high risk areas around corners. Nitro fuel comes in 2 litre containers for around £30 (not in gas bottles like the real cars, as dad thought!). Tip 1 Choose a local club and find out what cars they run in their championships etc. before you decide on the car & motor to get if you’re going to race it. Then you’ll have advice and fellow nuts on hand. For example Schumaker make some of the quickest nitro models in the world, but the UK currently has only one championship for them. Tip 2 If you're not going to race them, decide where you will be using it. Then there's electric motors. They are cleaner but rely on heavier batteries for power. Typical top speeds are from 15 to 60 mph – depending on your motor and gearing - but have better torque and acceleration as nitro cars have to deal with a clutch & gear changes. How long do the batteries last? They’ll run for 5 – 25 minutes in races (constant running) depending on the battery size, and motor tuning. And whether you keep the speed up and don’t stop. Starting a tuned motor drains the battery a lot. I think swapping over batteries is faster than re-fuelling nitros but then you have to buy more than one battery! What size are the models? 1/10th scale is a good compromise – its stable over bumps outside, gives you a good chance to control at high speed, is good for looks, yet still easy to carry and store. It’s also popular and not as expensive as larger scales. Indoors, in limited space, smaller scales will be better….like 1/17th or 1/18th. Latest technology has improved the 1/20th scales a lot if you only want to run them in an indoor hall. They are all quick and cheaper than the 1/10th size. What does it cost? For Electric set ups you’ll need a car, car battery & charger, controller, control battery & charger. In most cases the controller, batteries and chargers are not supplied with the cars. They cost about £100 – £200 for the cars, £20 for the batteries and £45 for the controller and charger. Nitro engined cars are more expensive to buy and run. Try eBay and similar sites for second hand too. What are crystals? Crystals are the chips that set the frequency your car transmits and receives. There are 2 crystals, one for the transmitter and one for the receiver. If they don’t match you can't control your car, and if a friend has the same frequency then the most powerful transmitter/battery will control both cars. Before you can run with others the frequencies have to be checked & changed if they conflict. What’s the controller’s maximum range? The controller on full battery will go for about half a mile, but very rarely is there a half mile in which to use it – that’s probably too far away too see anyway. Finding Your Local Clubs? Ask your nearest r/c model shops, or look in magazines like R/C Racer. Internet searches are not as reliable – not all clubs have sites you can find - but you could try. Do I have to build it myself? No, there are Ready to Race (RtR) and Almost Ready to Race (ARtR) around too. Choice is more limited and performance could be dented. Or you could also pay for someone to do your body for you. I get my dad to help! How much space to race? You’ll know quickly yourself, two tennis courts - or a car park twenty car parking bay is about the minimum for 1/10th scale running. Twice that size is about the smallest for several cars at once. Where do we race? Using any of these cars in the street is not good. They will cause accidents because drivers don’t know how quick they can go. I was trying a new motor in my Enzo in a Tesco car park (after hours) at the same time as a Fiesta turbo and a motor bike were having a short drag race. The Enzo beat them both! My Ferrari does 40mph almost instantly and tops out about 60mph… and its nothing like the quickest. How do I measure up for a new body shell? Just because you have a 1/10th-scale chassis doesn’t mean a 1/10th-scale shell will always fit it. You need to know the distance between the front & rear wheels (the wheelbase) and the width across the axles (the track) on the chassis. In some chassis the wheelbase is adjustable. Lastly the body is hung off four vertical ‘posts’ – two posts near the front and two near the rear of the chassis. Reminder Don't cut down the posts if you want to adjust the ride height later. You need to make sure you can make holes in the new shell on its bonnet & boot that line up with the posts, and look good with the body at the right height. Best way is to take your chassis along and try it out on the new shell. If you can’t do that then measure up the old shell – its wheelbase, its track, and its front & rear post positions (from the front and rear of the old shell AND the chassis). Lastly don’t forget the foam that goes inside the front of the shell to help take hits… some manufacturers supply it to fit the shell, and some supply it with the chassis – either way it needs to be shaped so it fits with no gaps. Tip you can get ‘L’ shaped posts to change their upright position if needed. I’ve seen a Dallara X1/9 too but don’t know who makes these historics. The search for Cool, Fast, R/C FIATs goes on! TAMIYA – Easy to tune basic but reliable chassis. Tamiya Holland has a good list of Body Parts (www.tamiya.ni/tamoptions/tam_53000_06.html) and Wheels. (www.tamiya.ni/tamoptions/tam_53000_05.html) try searching for the US version too. YOKOMO (www.yokomo.com) bit cheaper than Tamiya about the same quality.